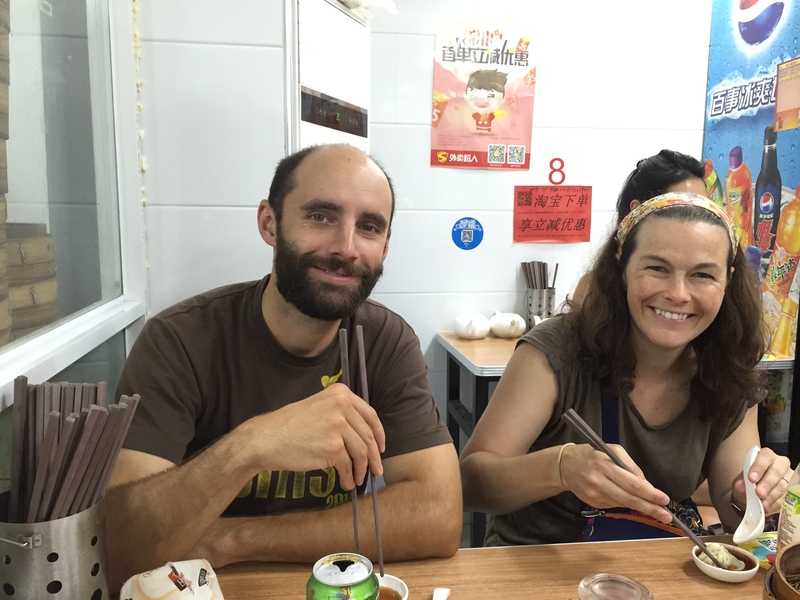 At the end of June, Jason and I had the pleasure of hosting my brother Jon and sister in-law Rachel in Shanghai. 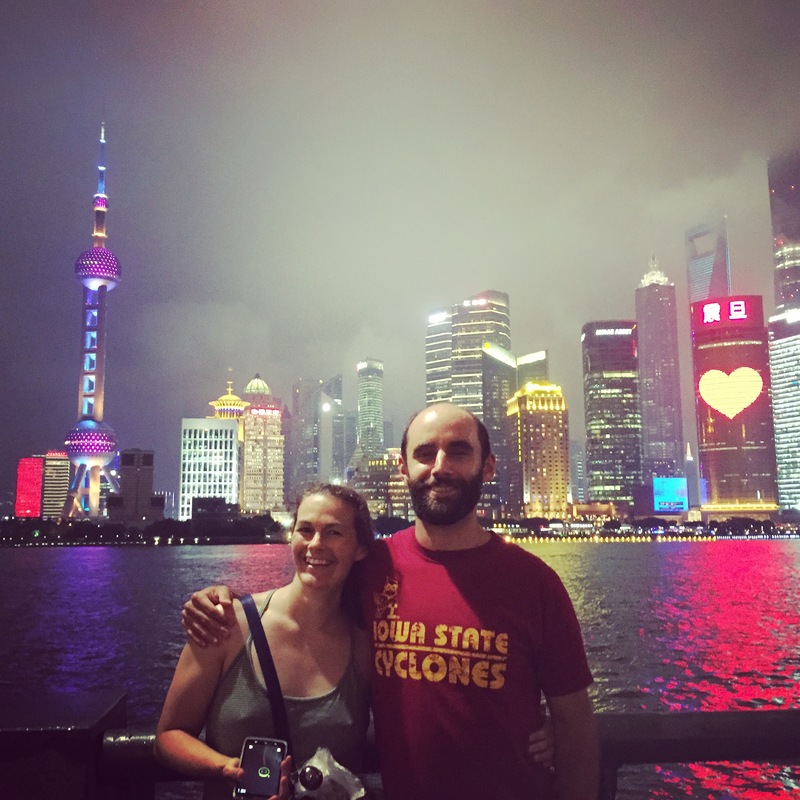 After spending a week in Beijing, Jon and Rachel flew in to Shanghai the day after our school let out. Before heading to Chengdu we fit as much in as we could as the weather was pleasant and the air quality was good. 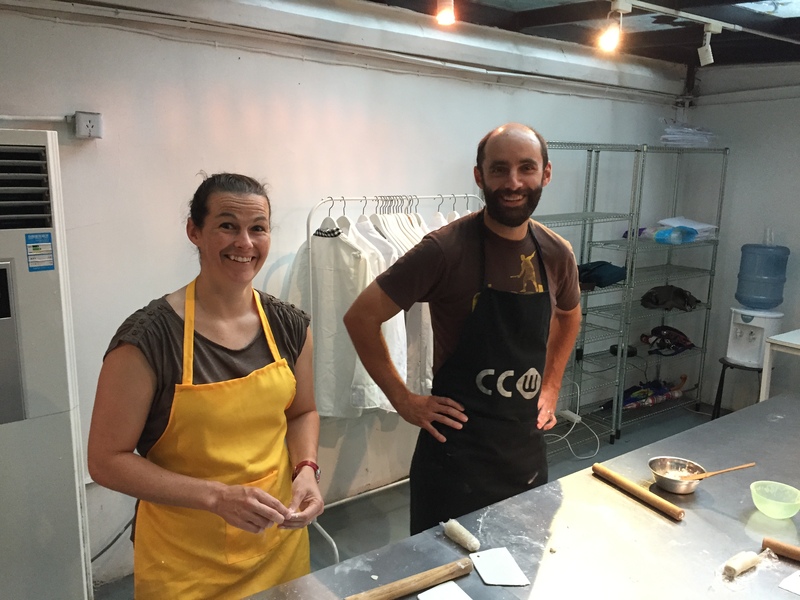 On the day that they arrived, we took Jon and Rachel to our go-to tailor Tony and Helen at the local fake market that we frequent as they were interested in making some cheap tailored clothes. On our way home, we stopped for lunch at a delicious Muslim pulled noodles restaurant near our metro stop (S. Shaanxi) on line 10. 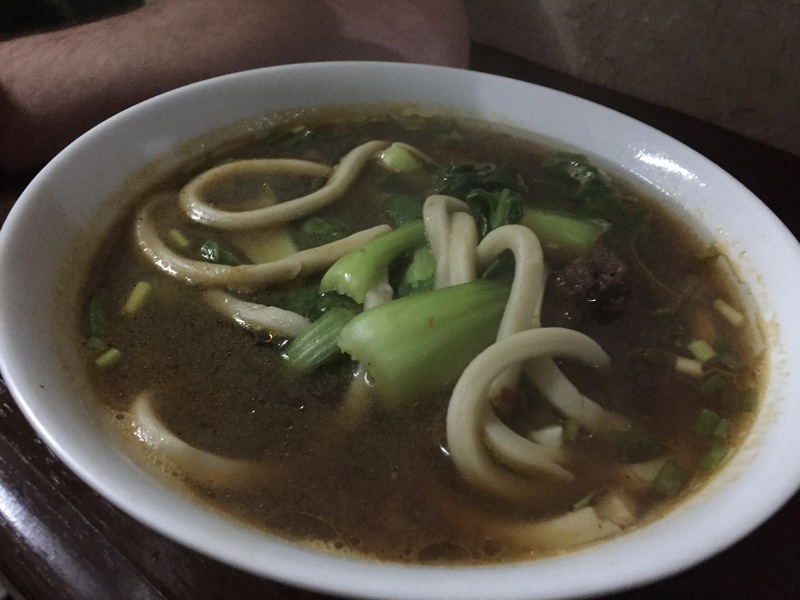 For less than 40RMB we ate some tasty hand pulled noodles. 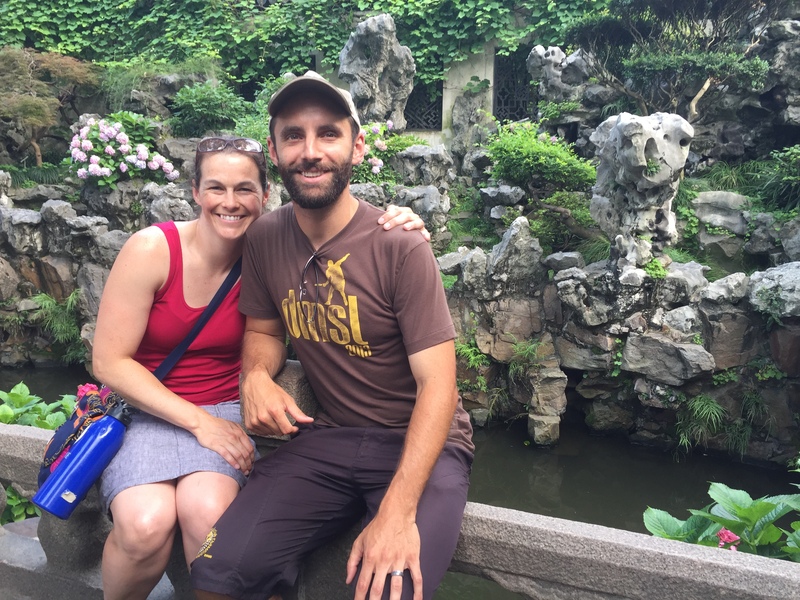 We then headed to YuYuan Gardens. This place isn’t my favorite since it’s so packed but the area surrounding it has some cool areas to explore. 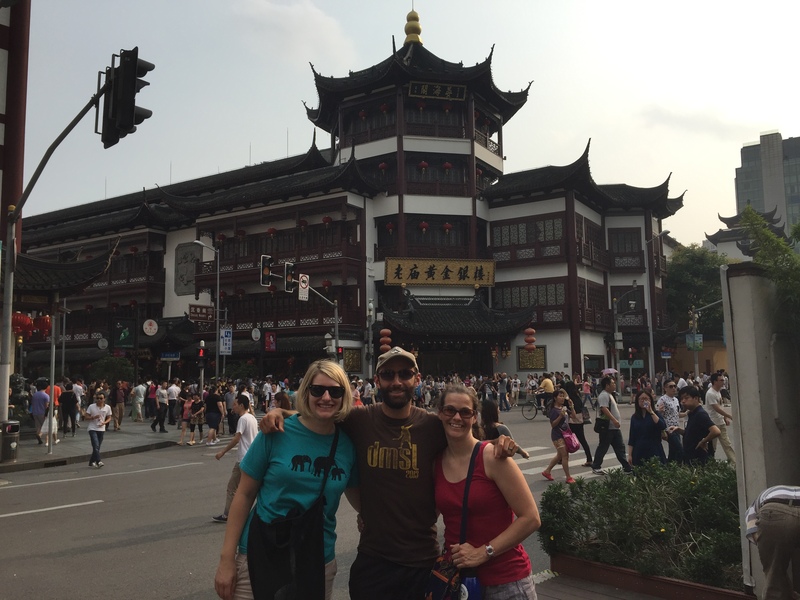 After exploring Yu Garden, we went to Yongkang to have some beers and meet some of our friends. I always enjoy having family meet our new friends. As an expat it’s hard for our family to relate or understand how we live our lives. Connecting the two worlds is always fun. After our trip to Chengdu (see previous blog post!) we finally had two days without rain. Unfortunately, the trade off was extreme heat and humidity. On Wednesday we took the Maglev home from Pudong and relaxed in the afternoon. By relaxing, I mean Jon and Rachel worked out, Jason went on a bike ride, and I took a nap! 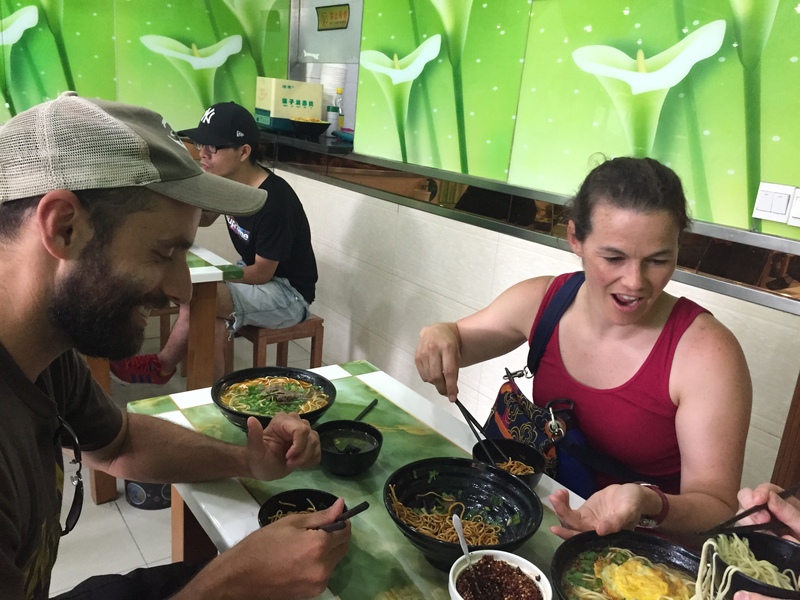 We hooked up with my friend Boramy for some Yunnan Food at a restaurant called the ‘Lotus Eatery’. I always forget about how tasty this style of food is. Lotus Eatery is a cheeper version of the popular Lost Heaven. 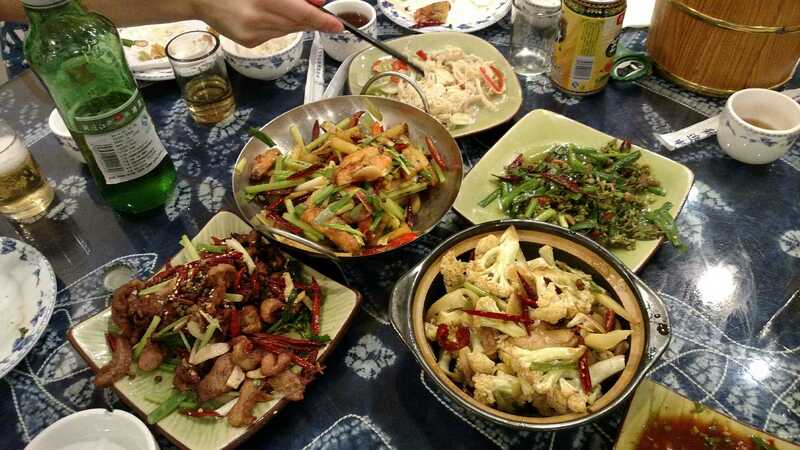 The menu has a variety of Yunnan standards as well as some typical Sichuan dishes. After dinner we went to Tianzifang for an evening stroll and shopping. I always think it is better to go to Tianzifang at night. It’s cooler, less crowded and prettier. After exploring we decided to meet some friends at Jackie’s Beer Nest for some great beers and amazing dumplings at a near by food stand. We ended up running in to some other friends who showed us the noodle place featured on Anthony Bourdain. They only sell one thing and it is delicious! Seriously this place was awesome! Jason and I will definitely be back! After a late late night we slept in on Thursday and decided to explore Qibao. The weather wasn’t best for being outside all day but the views were pretty! We then decided it was time for some R&R so we all got massages! Since it was so hot, this was a perfect way to unwind after a long day. Later that night Jon and Rachel went to the circus/acrobat show! On Friday, it was non stop rain. We stopped and got a Jian Bing (Chinese breakfast crepe…it’s amazing and less than $1) and then some coffee before making a plan for the day. 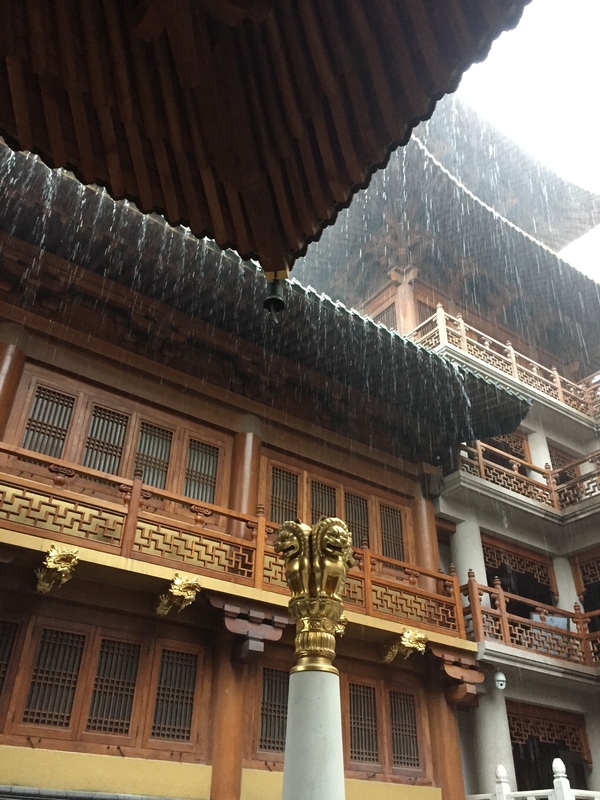 We decided to head to Jing An temple. The weather wasn’t nice. As we were there it started to downpour and thunder storm. It did allow for some beautiful pictures! Since Jon and Rachel had to pick up their clothes we decided to head to school and show them where we work. Later that night we had some Hunan food and took them to the Bund. Even though it was rainy and cloudy the views were still pretty nice! On Saturday we had a Dumpling Tour from Untour Shanghai! The tour was most of the day and super fun. We started out by having fried dumplings. These suckers are so hard to heat. They always squirt grease and oil when you take a bite! 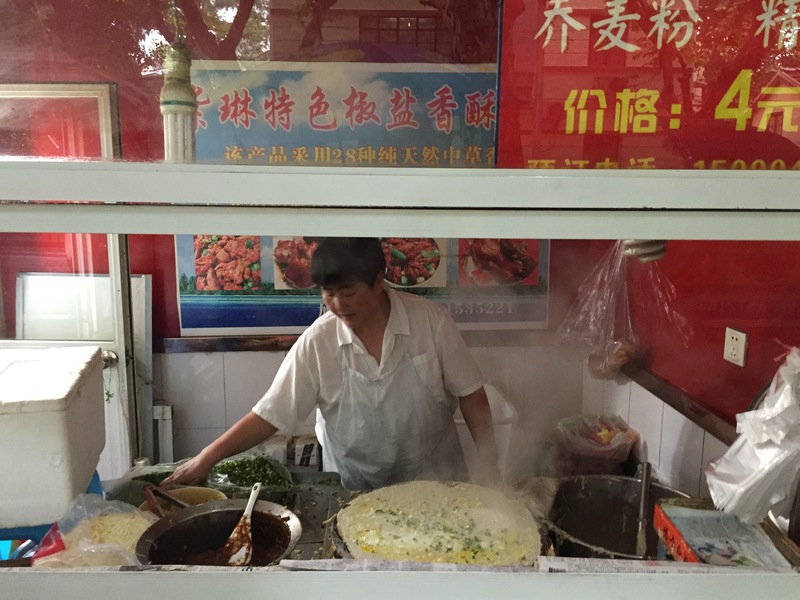 We then stopped for a Jianbing before having trying our 2nd dumpling a Xiaolongbao or soup dumplings! Jason and I are no stranger to these dumplings and as always they’re delicious! The best way to eat these is to take a little bite and carefully drink the soup and then eat the dumpling. Be careful because most people get burnt! After already consuming a large amount of food we walked a little ways to our 3rd dumpling stop that had boiled dumplings. These things were tasty. There were 3 different kinds: cabbage, celery, and egg as well as an interesting bamboo tofu dish. You can see the tofu below. The texture is a little weird but the flavor was nice! The best part about this little place was their homemade sauce. 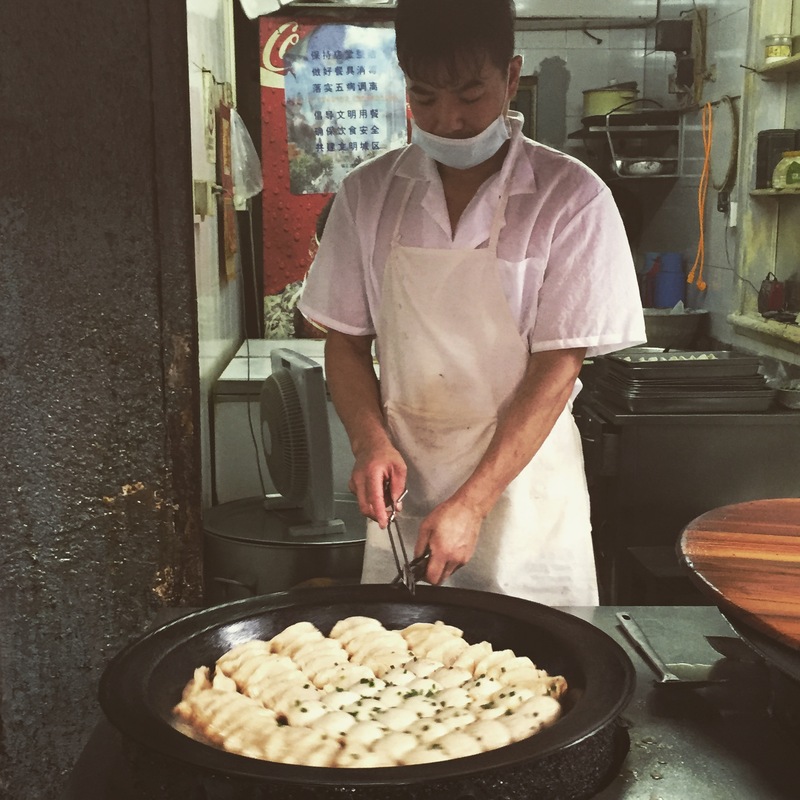 Before the end of the tour we all had a chance to make shengjianbao, Shanghai’s famous pan-fried buns. In my opinion it’s too much effort to make dumplings when you can get them for so cheap! After our cooking class we were SO FULL! Untour was a great experience! Our guide was friendly and very easy to talk to! 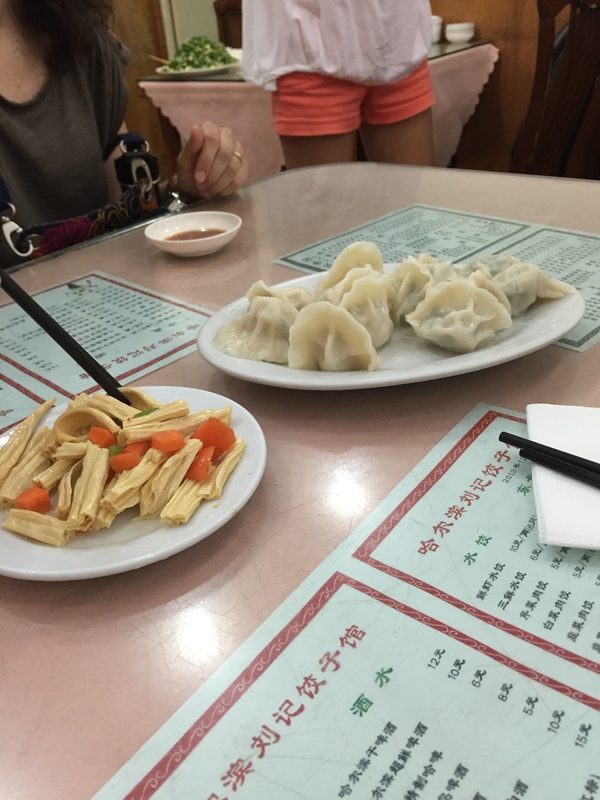 The best part is we learned about all these new great dumpling spots! On Sunday we had to do some last minute shopping in the rain! With our tour we got some recommendations on where to eat. One of them being a noodle shop! Just imagine noodles in a sesame and peanut sauce with a little bit of spice. These things were awesome! It’s recommended to stir up these noodles immediately upon arrival and it’s very important that you do, otherwise they all get stuck together! It’s always great having visitors. And even though we live in Shanghai, we are always finding new and exciting things to do and eat! I’m so happy that Jon and Rachel were able to visit, we all had a great time! Don’t forget to check out and download the Shanghai Bloggers app! It features amazing blogs about Shanghai!